The picture shows the first parts of the electrical system. One charger CHAMP III 12v/7A from PRIMEPOWER It is very compact and waterproof, ideal for a little boat. 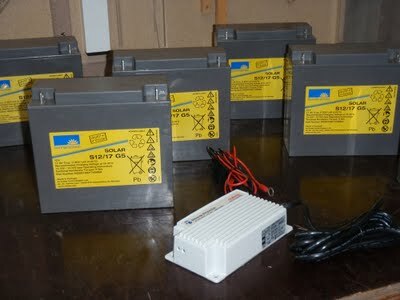 There is also six 17 amp hours Exide Sonnenschein gel batteries. Gel batteries have a better cycle life, they can be cycled deeper and more times than Agm batteries. Agm batteries can are better for starting engines but on board there is no engine.